This unearthly beautiful rendition of an old hymn is sung by Aled Jones, with some of the words in Welsh. 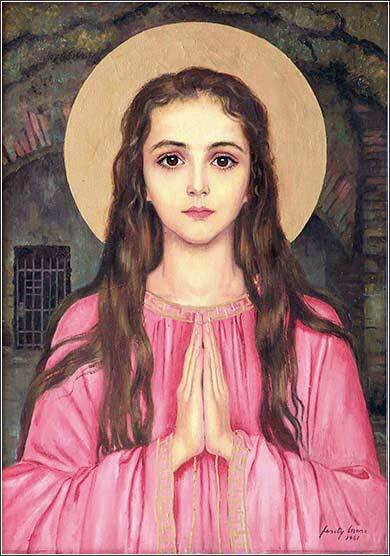 Saint Philomena by Hungarian artist Feszty Masa, 1961. Then one of the elders addressed me and asked, “These who are dressed in white robe—who are they, and where do they come from? “You know, my Lord,” I answered him. Then he told me, “These are those who have come through the great oppression: they have washed their robes and made them white in the blood of the Lamb. That is why they now have their place before the throne of God, and serve him day and night in his temple. The Revelation of St. John the Divine, known simply as Revelation or Book of Revelation, is perhaps the most difficult book in the Bible for many Christians. Comparatively few people read it, and probably most Christians are wary of it, because of the elaborate weird imagery describing the Second Coming of Christ. To say that Revelation is an “apocalypse“ just adds to the confusion, because few people understand what the word actually means. Apocalypse means “revelation” — the lifting of a veil or curtain, so that something previously unseen can be seen. It usually refers to a prediction of the end of an era and the beginning of a new one. The narrow meaning of “apocalypse” that most people have — a violent and frightening end of the world — really originated from the Book of Revelation itself! But one could as easily call Daniel apocalyptic, or even the more prosaic works of someone like Marshall McLuhan, the man who coined terms like “the global village” and “the information age” to describe the great changes in society we have been seeing in the past 50 years. Today's Bible passage describes heaven. 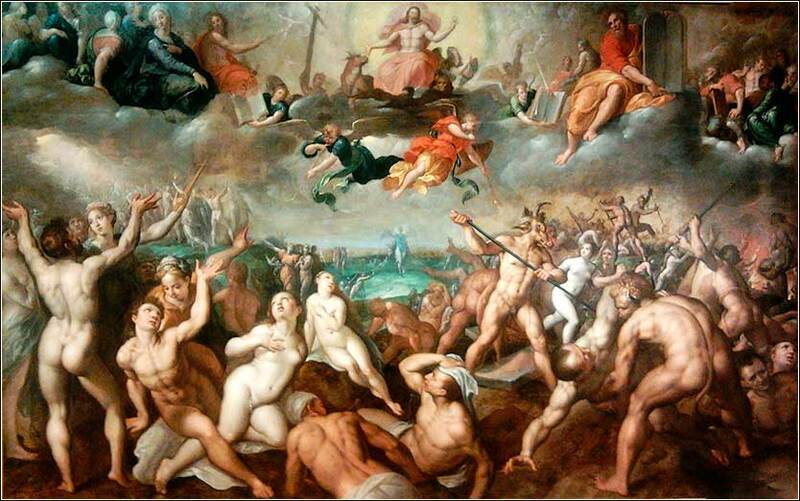 It depicts the relationship with God, after the Day of Judgment, of everyone who has been saved by Jesus Christ. Revelation was more popular in ancient times, when people wanted a literal, concrete description of what eternity would be like. In parts of the book, metaphors from the teachings of Christ become concrete images, such as the “springs of the water of life”. One particularly helpful image is John's description of “the blood of the Lamb”. This rather gory concept is often embraced by very fervent Christians but somewhat disturbing to others; John tones the imagery down, by showing us that this blood is just a figurative expression for the sacrifice made by Christ and that washing a robe in it, rather than being gory, is a process that will turn the robe white. Figuratively, the “blood” is a bleach, one that is so powerful it removes the stain of sin entirely. So those who have been saved by their belief in Christ, a countless multitude from every nation, are dressed in perfect white robes. This is a visual metaphor for the grace of Christ, which removes the figurative discoloration that sin has left on our souls and leaves us in perfect innocence — represented by a perfect, snowy white robe — so that we will be acceptable to stand before God. In the final paragraph, John gives us a lovely bit of poetry, words of comfort and peace to describe how a time awaits us, when all our suffering will end. This too is apocalypse, even though a marked change from the mass of terrifying imagery that characterizes Revelation. For a curtain is lifted to show us that all will change; pain will end, and God will give us perfect happiness.